Realm Royale on console runs like a dream, but is it enough to save Hi-Rez’s foundering battle royale? For every winner in battle royale, there’s 99 others who miss out on first place, and that zero-sum climate extends beyond the shrinking arenas of every in-game match too. Titles like Fortnite, H1Z1, and Black Ops 4’s Blackout may have found success with their respective takes on battle royale, but so many smaller, cheaper imitations have come and gone in a flash over the course of 2018, catching everyone’s attention for a short spurt of time before quickly losing steam once the honeymoon period fizzles out. Radical Heights was Boss Key’s last ditch (and ultimately unsuccessful) effort to save itself from closure, The Darwin Project hastily went free to play in a bid to boost its dwindling audience, and The Culling 2’s launch was so poorly received that developer Xaviant had to pull the game from sale just one week after release. Realm Royale, meanwhile, originally started life as Paladins: Battlegrounds, a separate mode for Hi-Rez Games’ hero shooter Paladins, first announced in January earlier this year. But development moves at a fast pace at Hi-Rez (the company recently split into three subsidiary studios, all working on different projects) and, less than a year later, Paladins: Battlegrounds had spun off into its own separate title, Realm Royale. A class based, MMO-infused take on the last person standing deathmatch mode, Realm Royale featured rideable mounts, weapon crafting, and an inspired spin on being downed that turned defeated opponents into suicide flag waving chickens. The formula proved popular. 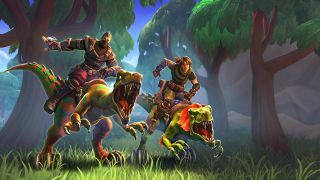 Upon launching in early access in June, Realm Royale quickly reached a peak concurrent player count of over 100,000, with famed Fortnite streamers like Ninja and Shroud even picking up on its underdog charm. But the unexpected providence was not to last. Within less than two months, Realm Royale’s concurrent player count dropped to an average of 5000, marking a 95% drop from its peak over the summer. This decline continued into the Autumn until, just like that, the game had been left behind by battle royale fans in favour of experiences new and old. But Hi-Rez, whose twin pillar titles Smite and Paladins continue to enjoy a healthy audience, wasn’t ready to give up there. Over the last few months, internal studio Heroic Leap has been working hard not only to improve and retune Realm Royale, but to finally bring the game to PS4 and Xbox One. At the Hi-Rez Expo this weekend, the developer announced that closed beta keys for the game on Xbox One were already being rolled out, with PS4 codes expected “very soon” for those who originally expressed interest in the testing phase earlier that year. That next step, it seems, was Realm Royale’s promised release on console, which it’s finally been able to deliver on. Trying out the closed beta on Xbox One for myself, the port proves to be a successful translation onto console, flaunting Hi-Rez’s trademark of smooth, aesthetically pleasing gameplay that could easily allow for a viable competitive scene on the system. For every winner in battle royale, there’s 99 others who miss out on first place. Meanwhile, the changes Heroic Leap has already made to Realm Royale since launch have, more than anything, removed the game’s needless complications that fans were originally sour on. A fiddly armour system has been discarded in favour of a potion-based model that apes Fortnite: Battle Royale’s shield consumables, while the ability to explore the airship before jumping into the arena adds a simple but effective layer of pre-game tension and immersion to each match. On the show floor of HRX, conversations amongst Hi-Rez fans speak of Realm Royale with uncertainty and skepticism, joking about it going the way of Hand of the Gods, another game from the studio that was announced, launched, and left to die within two years (there was tellingly no mention of it throughout the entire convention). Certainly, despite the determination coming out of Heroic Leap at the expo, it’s very possible that Realm Royale could still yet fall by the wayside. Arriving on console will certainly introduce the game to two more sizeable install bases but, with Blackout, PlayerUnknown's Battlegrounds, and Battlefield 5’s Firestorm either already out or upcoming to PS4 and Xbox One, the competition is fiercer than ever. Cross-play and cross-progression between PC and Xbox One (and potentially PS4, depending on Sony’s whims) is also planned for Realm Royale, a $25,000 tournament took place over the weekend at HRX, and you can probably expect a Nintendo Switch release sometime in the future, given that both Paladins and Smite are now official apps on the platform. But it remains to be seen whether Realm Royale will show at next year’s HRX or whether, like Hands of the God, the game will be forgotten by Hi-Rez as though it never existed in the first place.